Two weeks ago, Netflix (NFLX) appeared to be back on top of the world. The twelve-month leader among FAANG stocks and knocking on the door of new 52-week highs, it was a tempting buy. The subtle hints never took root though. That is to say, the buyers never poured in whole-heartedly enough to get NFLX over the hump, which has let Netflix shares slip dangerously close to a breakdown again. Rather, it's been Apple (AAPL) and Amazon (AMZN) - two names that were toying with decided bullishness with our last look --- that have turned into the most compelling runners. Such is the case with FANG stocks, or FAANG stocks if you include Apple in the mix. They somewhat run as a herd, but it's not a close-knit herd. It's fun to bet on the whole group, but it's often more fruitful to cherry pick the budding leaders and laggards from within the group. It's also not terribly difficult to do, when you've limited your universe to just four or five names. The graphic below tells part of the tale, laying out the percentage change performance of the last twelve months for all five FAANG stocks. Amazon has taken the lead, always remaining ready for Netflix's stumble. Meanwhile, Apple has roared back from last place and is looking to lap Alphabet (GOOGL). 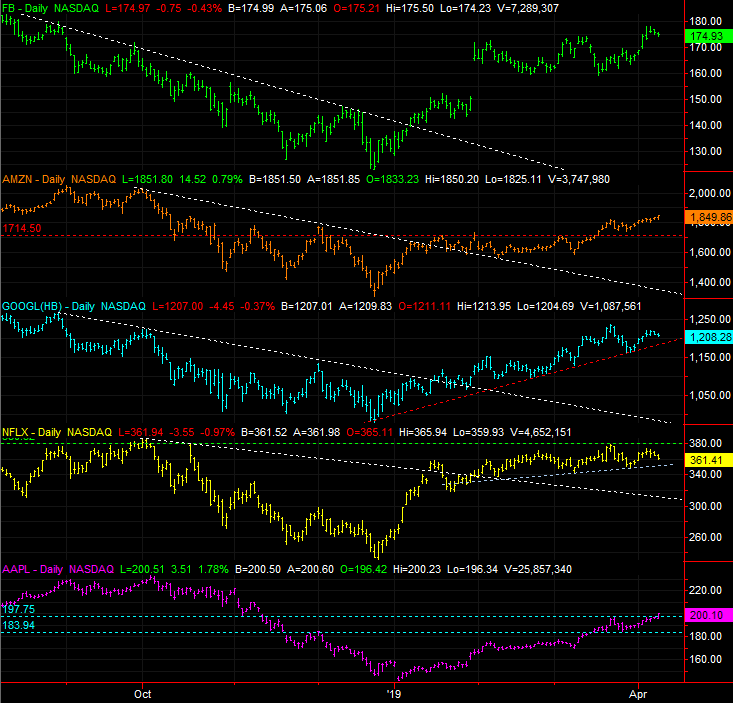 It's a graphical representation that pinpoint relative strength or relative weakness. 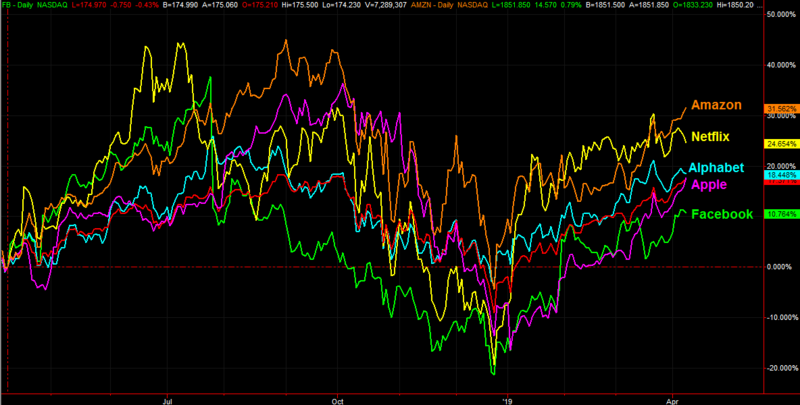 It's not a chart, however, that tells the whole story of the market's five most-watched names. A look at each daily chart on its own can also be quite telling. That's what the image below does. It's in this timeframe we can learn much more about these budding trends, or budding pullbacks. 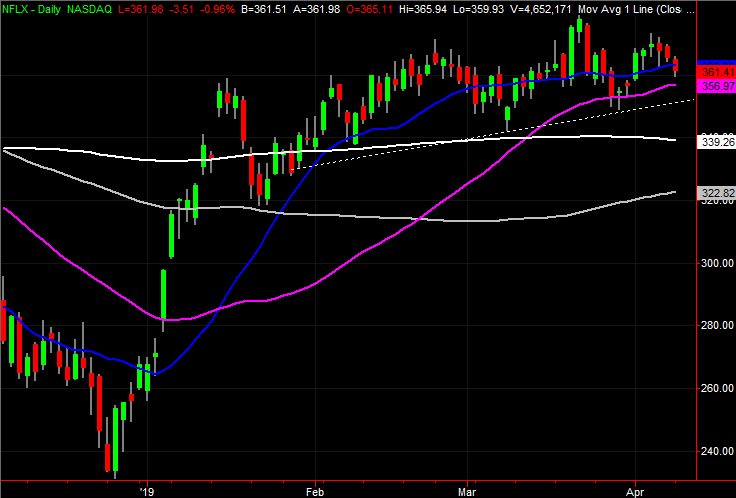 Take, for instance, the new weakness evident in the shape of the GOOGL chart. The bigger-picture uptrend is still alive, but we're now looking at the first lower high. A test of the support line that extends back to late-2018 and tags all the key lows made since then. We may just test that floor this week. If it breaks, and/or Alphabet shares fell below Apple's performance line on the twelve-month gain chart, that's going to be a difficult name to justify owning. At the other end of the spectrum, Apple shares really are making real net progress. Thanks to Monday's 1.8% again, another ceiling around $197.75 has been cleared, and there are none left to hold the stock back until getting back to October's peak around $232. Amazon is also make real, but sustainable, progress. With all of that being said, Netflix is still the big name to watch. We already know it's turned into an underperformer just within the past several days. On the basic daily chart (of each stock's daily bars), we can see that it too is within striking distance of a technical floor that extends back to early February. It's plotted in gray. If that floor snaps, there's not much left that will be able to keep the stock afloat. That support level, by the way, is somewhere in between the 50-day moving average line (purple) and the 200-day moving average line (white) on the more detailed daily chart below. This level of study into just five stocks may look and feel like overkill, and too exclusive of the thousands of other names that are not one of the FAANG stocks. These five names though, between them all, provide more than enough trading and investment opportunity for all ilks. They're volatile in the short run, but profitable in the long run. They're also disparate enough to build in a little diversity for traders that may want to take on more than one trade at a time. BigTrends has even made an options-trading service that acts on the idea of limiting a focus to just a handful of names, but learning all the nuances of those names. The FANG Options Trader Advisory Service suggests about eight traders per month, but no more than two holdings at a time. Many subscribers find the FAANG stocks alone offer more than enough trading 'action' to keep them busy. Here's how you can harness the power of that attention and focus.